Snehasadan in collaboration with Yenepoya Dental College and Health Science we prepared a series of Dental Camp and treatment at Snehasadan this year which was very supportive and caring for the inmates of Snehasadan especially for the orphan and vulnerable children residing in the house. 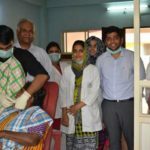 Dr. Ganesh Shenoy, HOD of Public Health Yenepoya Dental College and head of the committee for the Oral Health policy of Karnataka State Government inaugurated the Camp in the presence of Sr. Savina, Director, Jeevadan, and Fr. Russel, Administrator, Snehasadan. Rev. Fr Teji Thomas, the Director of Snehasadan welcomed the team and introduced the vision and mission of Snehasadan as it is completing 15 years of service in HIV infected and affected Orphan and Vulnerable Children. Dr. Ganesh Shenoy and Dr. Praveen Jodalli systematically organized and supervised the team of 25 members to provide the best care and treatment for the children and adults in Snehasadan and Jeevadhan. Dental screening was done to all and then they planned for the basic treatment like cleaning, removal of decayed tooth, and filling. It has brought joyful smiles to all the kids. We found all the doctors and staff were very much dedicated and generous in providing their service. They have assured their service in the coming years and whenever we are in need. The well-equipped Clinical facility Bus was an added attraction to all the children. The gentle approach of the doctors helped the children to be at peace. 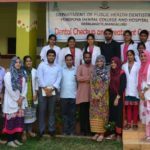 The program saw many young dentists who were enthusiastic and passionate in fulfilling their dedication without any reservations. The event also explains the longstanding relationship of Snehasadan family with Yennoppaya medical college in offering care for the vulnerable children and adults here. Snehasadan family remains profoundly grateful to the whole team of Yennoppaya medical college for their noble and fine service.